India is a fairly stable economy; so the boat will rock, but won't overturn. If all goes well, India should achieve 7.5 per cent GDP growth in 2015-16, notes Omkar Goswami. An 'earthquake' shook global stock markets on August 24, 2015, a day that is being called 'Bloody Monday'. The 'epicentre' was China. Already going downhill, the Shanghai Composite index crashed by 8.5 per cent in a single day. With it, Hong Kong's Hang Seng tanked by 5.2 per cent; Japan's Nikkei 225 by 4.6 per cent; Singapore's Straits Times by 4.3 per cent. Further afield, the UK's FTSE 100 slumped 4.6 per cent; the US Dow 3.5 per cent and S&P 500 four per cent. 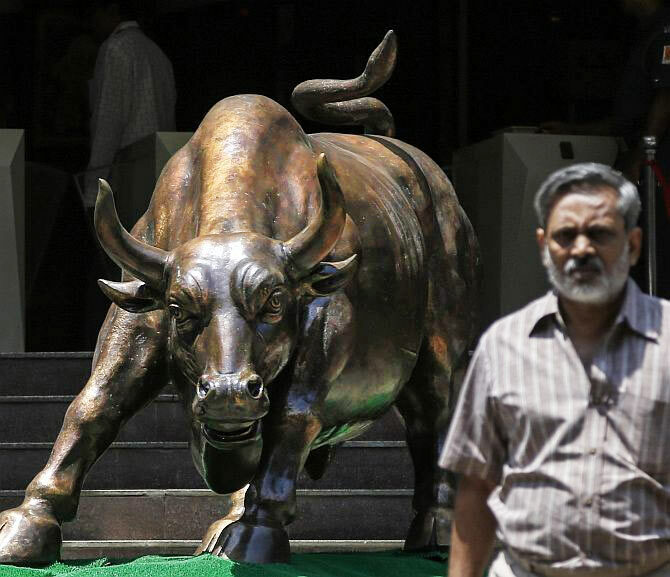 In India, the BSE Sensex tumbled 5.9 per cent. While other markets recovered, Shanghai continued to fall - by another 7.6 per cent on Tuesday (August 25) and 1.3 per cent on Wednesday (August 26). In this piece, I shall try to address two broad sets of questions. First, what are the weak links in the Chinese economy and how did these contribute to the crash? And second, to what extent could these factors affect India? Let me begin with China. Everyone was aware of China's growth slowdown. Long used to the 'normalcy' of double-digit gross domestic product (GDP) growth - at worst reducing to between 8.5 and 9.5 per cent - China slowly trended down from nine per cent to eight per cent. Despite the Communist Party of China's clarion cry of 'Maintain Eight', the economy slid further. Growth estimates for 2015 range from seven per cent (JP Morgan) to 6.8 per cent (International Monetary Fund or IMF). For 2016, the IMF expects 6.3 per cent growth. Chart A plots the annualised quarter-on-quarter growth of China's GDP and shows the downward trend. So, growth declined. Yet in a world awash with money, with the eurozone going nowhere and the US growing at 2.4 per cent in 2015, how can 6.8 per cent growth for the second-largest economy of the world with a solid trade and current account surplus, consumer price inflation of 1.6 per cent and $3.65 trillion of foreign currency reserves cause a major stock market meltdown? True, lower growth caused anxieties. But it was not the proximate cause of 'Black Monday'. The reasons lie elsewhere - specifically the deployment of domestic savings and foreign institutional investments. China's gross savings is 50 per cent of GDP. With interest rates at under six per cent through 2013 and most of 2014, bank deposits looked unattractive. What glittered was housing: for living and as an investment opportunity. As in India some years ago, apartment prices exploded. For 20 months beginning January 2013, prices of newly built houses rose dramatically. Financed by generous bank loans, this eventually led to a massive excess supply of unsold houses. From August 2014, prices started falling, and have remained depressed till today. Faced with growing non-performing loans to builders - which further exacerbated the problems of a poor banking system, with opaque income recognition and inadequate loan loss provisioning norms - the Chinese leadership enthusiastically pitched for the next great income-earning opportunity: the stock markets. 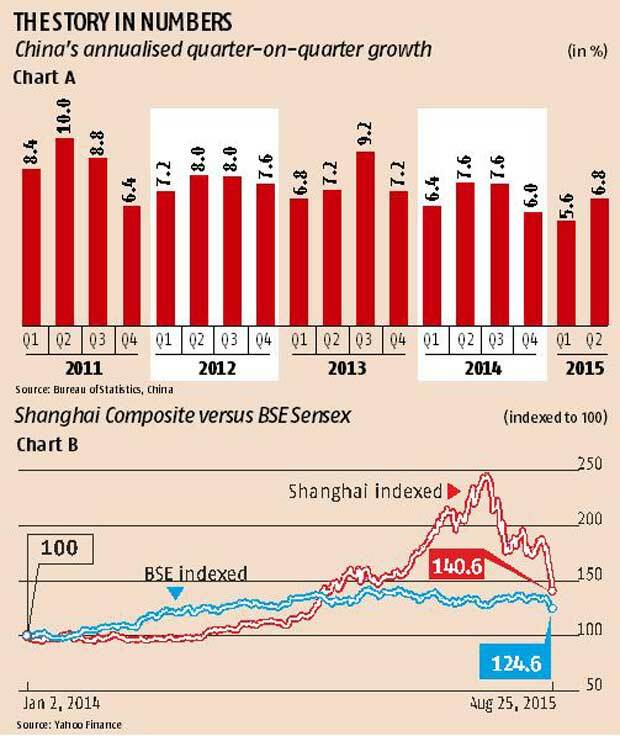 As Chart B shows, up to mid-July 2014, the Shanghai Composite was flat. Then it took off: first, gingerly and then at a blistering pace, as foreign investors also pumped in their money. By end-October 2014 it had risen by 12 per cent over mid-July; and at its peak on June 8, 2015 it was up 143 per cent. It was a classic case of two back-to-back asset price bubbles: first, housing, then stocks. In comparison, for all our media hype, the rise in the BSE Sensex was far more modest (Chart B). The bubble was waiting to be pricked. It happened in three instalments. The first was between June 8 and July 3, 2015, when the index fell 28 per cent. The second was a drop of 11 per cent during July 22-28. The third was a slump of 25 per cent during August 10-26, 2015. We might see a few more episodes of the market being spooked. What does this mean for India? First, we are a fairly stable economy. If all goes well, we should achieve 7.5 per cent GDP growth in 2015-16. I'm not claiming this; the IMF is. Second, given our large share of private consumption in GDP - 57 per cent in 2014-15 - most of which involves domestically produced goods and services, we have the nub of stability though not the triggers for exploding growth. In critical times, it is probably better to be a cud-chewing pachyderm than a cheetah sprinting everywhere for elusive kills. Third, it gives us a window for speeding up reforms: implementing the goods and services tax; spending real money on the grand infrastructure strategy of the last Budget; divesting even at lower offer prices; getting better bankruptcy processes in place; re-capitalising some banks; and doing more and talking less of 'achche din'. Yet, there will be hurdles. Another Chinese tremor or two will definitely rattle our stock prices along with those of other emerging markets. We should come out of it faster than China, but the upturns will take longer than the dips. The rupee will be under pressure, as it must with each big bear hug, when foreign investors grab their dollars. The Reserve Bank of India will need to intervene intelligently and tactically. Thankfully, this institution and its governor know their business. Moreover, it may be wise not to suddenly fiddle around with interest rates; and, instead, watch and wait a few months till the storm blows over. We might see some Chinese import surge, which may be countered by anti-dumping and safeguard duties. The boat will rock, but won't overturn. Because we are now better farers of choppy waters than the landlubbers of yore. The author is an economist and chairman of CERG Advisory Private Limited.